A large number of developments are now under construction close to the Southeastern line running via Greenwich, which will see cuts in the number of peak time trains in just over four months time. So it was a bit worrying to read a comment from ‘SEdriver’ on the London Reconnections blog casting doubt on longer trains being ready to run by January 2015. As previously reported, nearly 20% of trains will be cut in the evening rush hour on the Greenwich line. Capacity is supposed to be maintained by extending the remaining 80% of trains. If 12 car trains do not run then will this be achieved? But even if capacity can be maintained at current levels, it still raises the question of just how long will that be sufficient? Overcrowding and passenger numbers continue to increase, yet southeastern lines in SE London are some of the few in London with no plans for additional trains any time soon. After reading the latest comment casting doubt on longer trains, I decided to look into just what developments are now under construction, or due to start imminently. I’ve listed them below from Slade Green up to Deptford, and included only those that will see a reasonable number of people walking to stations. Ratio – 372 new homes. Close to Slade Green station and developed by Red Row. Construction is ongoing with first occupants moving in from September 2014. 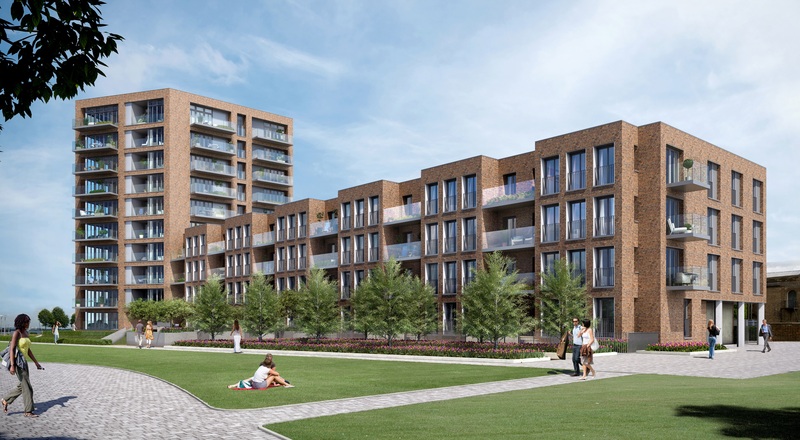 Erith Park – 622 new homes. Construction has begun. Replaces former Larner Road estate. Belvedere Park. 402 properties. Some complete whilst others are still under construction. Cross Quarter. 220 homes. Construction has just commenced. (Thamesmead) – 296 homes in Southmere Village Stage 3 under Gallions plans. New owner Peabody Homes is revising scheme. The development is within walking distance to station. No large developments nearby at present. Stage 4. 592 flats. Under construction. Located in towers above Crossrail station. Stage 5. 92 properties. Under construction. Located closer to Thames. Stage 6. 219 flats. Above Crossrail station. In two towers next to Stage 4. Imminent. Stage 3. 234 properties at ‘Laboratory Square’. Not yet begun despite following stages beginning. Presumably next? There are also 2,032 more flats planned in the Berkeley Homes masterplan and also other developments such as Crossrail’s planned development of 394 flats, but these are not advanced enough to add immediate pressure to the rail line. Connaught Estate rebuild – 654-684 new homes (Replacing existing homes here and at both Morris Walk and Maryon Grove listed below under Woolwich Dockyard). Net increase of 500 at three sites with 1100 homes demolished and replaced by 1600 new build. Work beginning summer 2014. Former Co-op department store. 74 flats in refurbishment of existing building. Under construction. Tesco ‘Woolwich Central’ stage 2 – 512 additional homes. Located next to currently built section. Construction not yet begun but should start soon. Developments at stations past Charlton have a wider choice of transport to major areas of employment. Some commuters will be using the DLR or Jubilee Line. However SE still provide quick access to central London and will be used by sizable numbers of commuters. Greenwich Millenium Village Stage 3. 500 properties currently under construction. Located about 10 minutes walk from Westcombe Park station so reasonable to assume a decent number will use southeastern trains along with the Jubilee Line. The many other developments on the Peninsula (many now under construction) will be closer to the Jubilee Line so the numbers using southeastern are likely to be limited. Greenwich Square – 645 in total. Former hospital site. Some buildings almost complete. Occupation begins soon. The Peltons – 86+ across three sites. Opposite side of junction to Greenwich Square. Parts complete September 2014. Alcatel Telegraph works – 272 flats. Planning permission April 2014. Cathedral Group. Lovell’s Wharf/River Gardens – 700 properties in total. Not entirely sure how many have so far been constructed, how many under construction now and how many to be built in future stages after planning permission refused in 2013. Enderby Wharf – 770 homes. Barrett Homes. Movement – 181 residential apartments, 358 student apartments, 104 bed hotel. Some completed. Located directly next to the rail and DLR station. New Capital Quay – 980 homes. Completing now. Caledonian Wharf / Hilton’s Wharf – 85 homes. Half this development seems to be under construction. This building runs alongside the Creek. Deptford Project – 127 homes right next to station. Can be seen above. Construction now begun. Paynes & Borthwick – 257 homes. Is this completely finished and occupied now? Last I saw it it mostly looked complete and I know some people have moved in. There’s also Convoys Wharf with 3500 new homes. This isn’t as advanced as many others listed above, as it has been in planning discussion and dispute for years. Though in March 2014 the Mayor gave outline planning permission and it is likely work will begin soon. There are many more developments in Deptford that are planned with many towards Rotherhithe. Their location will see a decent number of people using the London Overground but some will possibly head to Deptford station. Have I missed any others along the entire line that will place pressure on services? I’ve excluded many that do not look like starting any time soon. This also doesn’t include other developments that aren’t within walking distance of a station. Of course at other developments people will still drive, take a bus or cycle to a station but the list would just be too long. In addition there will are many more proposals at various stages of planning. Recent masterplans at Woolwich and Charlton would also see much induct rial land used for housing purposes particularly in some of the areas mid way between Woolwich Dockyard and Charlton. The excellent new Royal Greenwich Time blog has a recent post showing that Greenwich is projected to have the largest population growth of any London borough from 2011-2013, yet the biggest reduction in employment. This will put massive strain on transport networks as more people are traveling further to work. Though this post focuses on rail there will of course be big pressure on roads, health, housing, education and more from this growth. With all these developments under construction right now, or in advanced planning and likely to start soon, it is imperative that issues are overcome to ensure 12 car trains can run as soon as possible. In addition the process of securing additional trains for the line should begin as soon as possible so every train can make maximum use of new infrastructure. Greenwich council belatedly supported the push for re-zoning Woolwich Arsenal station. They now need to be joining Lewisham, Bexley and Bromley councils, as well as Dartford and Kent, in lobbying for more trains, as should local MP’s. The current vague plans which will only provide new trains in 3-4 years may be too long to wait. Click here to see a good blogpost from the Barneystringer blog which highlights that Kent has some of the highest numbers of people working in London compared to locally, compared to other counties surrounding London. I’m sure some readers are thinking why procure additional trains for a couple of years up to 2018, when Crossrail will render them surplus to requirements? Well, even with Crossrail the Greenwich line is in an area with the biggest population growth in London, so long term demand is there. Plus, many trains on the line arrive from Kent, where future growth will be focused to add to the numbers traveling into London, with large scale developments planned at Dartford, Rochester, Chatham, and Ebbsfleet Garden City (next to Northfleet station). Any new stock would find a long term use. The future of the rest of the Woolwich Central/Tesco development is in doubt at the moment as they are pleading poverty. Tesco/Spenhill agreed to pay half of the consultation costs for the final phase SPD (along with the basement and first two floors of the 27-storey tower at the back) in return for being released from their development obligations. This didn’t get much publicity for obvious reasons. Hardly a surprise given the woes Tesco are facing at the moment. http://www.londonreconnections.com/2011/two-of-our-carriages-are-missing-bringing-twelve-car-services-to-hayes/#comment-218709 assuming that is the one you mean. Yes, I too find this very pessimistic. I suspect the issue is lying dormant because there isn’t the stock around anyway. It may well be an achievement to get all Greenwich Line trains up to ten coaches – or at least those that need to be. Thanks. It’s true that there isn’t the stock around lying spare at all at this moment so new stock would need to be ordered as Southern, London Overground, First Capital Connect etc will see. There is the additional follow-up option on the recent train order from Southern which is so far unused. If this were taken up the new trains could possibly go to southeastern, or the additional new stock go to southern/FCC and they cascade stock to SE. That’s the plan for 2018, but it could be sped up if the additional option is exercised. That’s what local MPs etc need to campaign for. On the London Reconnections blog someone also made a comment that new trains to First Capital Connect (Thameslink) could also free up some existing trains used by them. That may well be happening as things stand even without the follow-up order taken up. The trains freed up by this were trains that were sent from from southeastern to them a few years back as noted on the blog. They could return to extend services with minimal adjustments and could well arrive a fair way before 2018. Plumstead Resident – Tesco aren’t doing well on the retail front and have cut back some plans for large mixed use developments across the country, but locally they do seem to finally be getting going at Dartford after 10 years of waiting (though I’d not believe it until work actually begins on site) and also are pushing ahead with their Bexleyheath store. Stage 2 of Woolwich Central is purely residential so the downturn in large scale supermarkets shouldn’t affect this plan, as if they start soon they will hope to catch the end of the housing bubble, which already looks to be slowing in London. It looks like they are playing hardball, which is quite typical of them, but skimming the document it seems the council recommended they get their way and contribute 50% of the SPD development. So pleading poverty may have got them more favourable terms and if agreed can now press on?